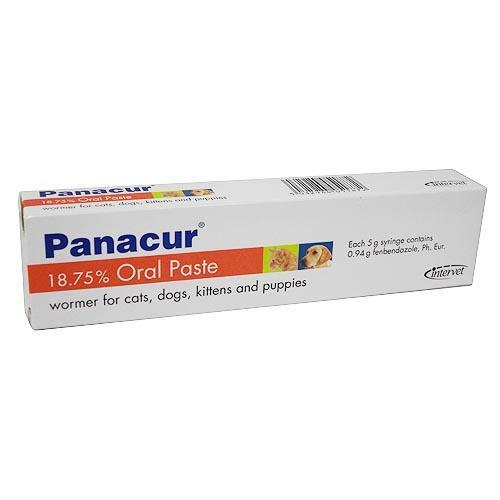 Panacur Paste treats worms in cats and dogs, It is a broad spectrum anthelmintic in the form of a paste which is administered by syringe directly into the mouth. 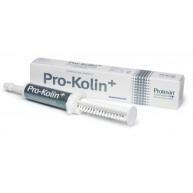 Used for the treatment of pet dogs and cats infected with immature and mature stages of nematodes (worms) of the gastro-intestinal and respiratory tracts. 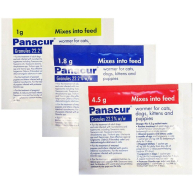 Panacur also has an ovicidal effect on nematode eggs. For the treatment of puppies and kittens infected with gastro-intestinal nematodes and puppies infected with protozoa (Giardia spp.). 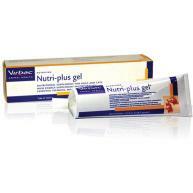 Also for the treatment of dogs infected with lungworm Oslerus (Filaroides) osleri or protozoa of Giardia spp. and cats infected with lungworm Aelurostrongylus abstrusus. 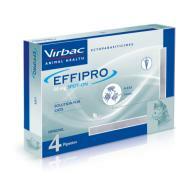 For a concise guide to dosages, consult the packet or click here.